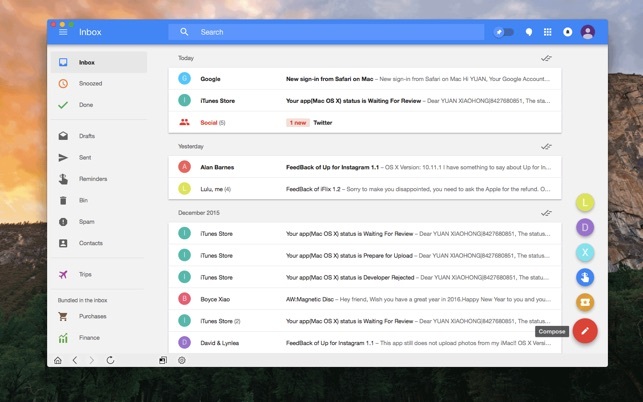 Mail Inbox, the best unofficial client for Google Inbox , brings Google's idea of the future of email to the Mac. Mail Inbox is not affiliated with, associated to, nor endorsed by Google in any way. Gmail, Google, Google Inbox and the Google Logo are trademarks of Google Inc.
Update 5/19: Text replacement is available. May have always been. Two-finger tap inside the reply field, go to Substitutions, put check mark next to Text Replacement. Works like it would in all other apps. Am very happy to have this feature in my desktop email app, have been waiting for it for a while. Would still like the option to open links in Safari by default, but app is well worth 5 stars even without it. Good app, nice to have Inbox on the desktop. Needs two things: support for Text Replacement Shortcuts, and the ability to select what browser to open links in. There is no preferences panel currently, to even offer this as an option. My preference would be for a preference panel. I’ve only had the app for 5 minutes, but everything else looks pretty good. Have been using Kiwi for the last year or so, but it only supports the non-Inbox variant, so stars on my mac wouldn’t show up on my phone, and pins on my phone wouldn’t show up on my Mac. Looking forward to transcending that pickle. However, links not opening in Safari might prove a bigger issue, Kiwi could do that at least. Both lacked support for Text Replacement Shortcuts, which I think is critical for anyone using Apple products, when you take it out of one program that you type in it slows you down everywhere else. I started using inbox on my iphone and ipad. it took a little getting used to (switching back to old clients and browser-based gmail serches) because I felt like I was missing emails. I don’t think I was, and I’ve adjusted to that feeling that I wasn’t seeing everythign. I’m using inbox on my mac PC now and have some suggestions and feature recommendations. Perhaps allowing up to customize window colors. The only distinguishing visual cue seems to be a small icon/picture upload om upper right corner. Its a little difficult to distinguish between one email account and another when opening several. Allow users to set a default for opening links contained in my emails. They open in an Inbox window and I want them to open in a full functioning browser of my choice. Currently I have to right click/copy link and then past it into a browser. This is just bad user interface, why fool us with a limited app native browser, it is a waste of time and functionality. This is a good replacement for Inbox, which will be going away at the end of the month. Looks and feels just the same. My only complaint is that it has it's own internal browser when you open links from an email. I would rather it open them in my default browser - where I have all my logins and settings. There is no way I can see to change this behavior. Also one email had some text up-side-down. I closed it and re-opened it, and the text came up fine. It doesn't look like there is any support for this app, which is too bad. I think a lot of Inbox refugees will love this.